Dr. Brian J Williams, MD is a Doctor primarily located in Midvale, UT. He has 20 years of experience. His specialties include Dermatology. He speaks English. The overall average patient rating of Dr. Brian J Williams is Good. Dr. Brian J Williams has been rated by 23 patients. From those 23 patients 12 of those left a comment along with their rating. The overall rating for Dr. Brian J Williams is 2.7 of 5.0 stars. I trust Dr. Williams; uber smart! The moment I walked into his office, he noticed redness on my scalp, which was one of the reasons I went to him, but I didn't disclose it. He also identified a cancerous melanoma on my face and caught it in time before it became a big issue. He knows his stuff. While he talks quickly, I felt like he spent quality time with me answering my questions and walking me through what to expect. I recommend him to my friends. He sees many members of my family. I've been going to Dr. Williams for several years. He and his staff is friendly and caring. The front desk girls are usually very busy but always take care of me with a smile. Dr. Williams assistants are very knowledgeable and take the time to answer my questions and concerns. Dr. Williams, himself, does business with a smile and a great sense of humor. My first visit to him was with concerns of a skin cancer. I didn't have insurance so he worked out a very doable payment arrangement. My most recent visit was just yesterday and everything was the same; still caring, still friendly, still funny. Thank you Dr. Williams and staff for making me feel like a valuable patient. I did not have a good experience at all. Every visit felt like he was very blunt, quick and speed talking so he could cram in as many patients as possible. He recommended a certain procedure and told me there would be no down time to recover. Well it took 6 agonizing weeks to recover and I couldn't even work. The wound wasn't healing and after 3 visits back to him with no results, I finally went to another doctor who gave me totally different instructions and it healed right up. The new doctor didn't think the procedure he recommended should have ever happened. Dr. Williams was most friendly the first time we met, although he did seem in a hurry. I agree with some of the other descriptions, that he could come across as a little condesending and quirky. If you want funny, go to a comedy show. If you want good medical service, I don't think this is the place. Both my son and I had a difficult time getting follow-up care. The doctor and especially the staff were distant and mechanical in their dealing with us as patients. I felt like it was a factory, "get them in, and get them out. I will not return to this office, nor recommend it for anyone else. Take a minute to learn about Dr. Brian J Williams, MD - Dermatology in Midvale, UT, in this video. Dr. Brian J Williams is similar to the following 4 Doctors near Midvale, UT. 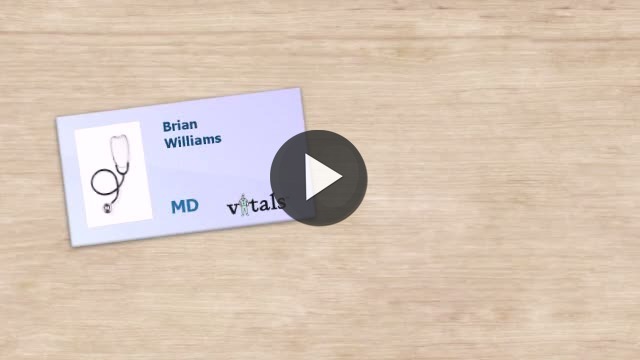 Have you had a recent visit with Dr. Brian J Williams? Select a star to let us know how it was.